I would love to say that fall is under way in Chicagoland but though the leaves are falling, we are experiencing exceptionally rare warm weather. I'm ready for jeans, hoodies and my favorite pair of boots! What do you love most about fall? Head over to our Facebook page to share about your fall favorites. Before you jump into the new week, I hope you had a chance to read Cheryl's and Cameron's stories. Cheryl's story about faith in the midst of uncertainty is inspiring and Cameron's honest story about battling perfectionism is something we all struggle with. You can read their stories on the website here or click on the links below. Our September series - Mosaic - continues this week with two unique and relatable stories by the same author. Jennifer shares about losing two very special people in her life and then she shares her battle with anxiety. Be sure to stop back to the website on Tuesday and Thursday to read, share and engage with our authors. The month of October is Pregnancy & Infant Loss Awareness Month which is befitting as we head to our one year anniversary and Eli's 5th angelversary. 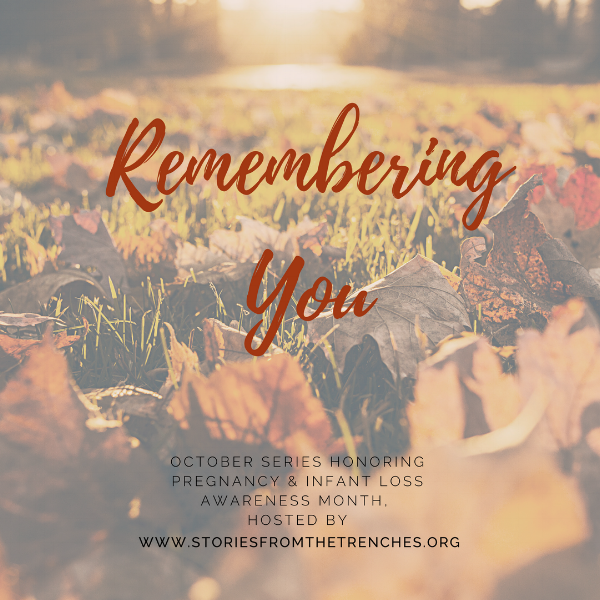 We would like to honor grieving mommas and their children for our next series - Remembering You. If you are grieving momma and would like to share your child's story with us, you can begin the submission process here. We are looking for a Creative Director to help with moving our vision and mission forward. Someone who thinks outside the box, knowledgable about ongoings in social media/marketing/public relations and who has the rare gift of creativity. The candidate also needs to be compassionate and empathic towards our audience—women who are experiencing the trenches of life and finding healing, support, and encouragement through sharing their stories. This volunteer opportunity and our other open positions can be found on the website or you can always email me! Are you a busy mom like me? Juggling multiple schedules and responsibilities? I feel like I spend most days like a chicken with my head cut off. Yesterday, my family decided to visit old pastoral friends at their church and ironically enough the sermon was on....rest. Apparently a topic that I need to meditate on given my current state of busyness. How do you balance busyness and rest? Comment down below with your wisdom and advice.